Peptic ulcers are the sores that form in the lining of the stomach, lower esophagus, or the first part of the small intestine. Our stomach may become ulcerous anytime, but chances go up as we get older. Peptic ulcers occur due to the eruption of the inner lining of the stomach wall due to the highly acidic digestive juices. The most common causes of peptic ulcer are infection by Helicobacter pylori. Stress, spicy foods, long- term use of anti-inflammatory drugs and analgesics may cause peptic ulcer. Long-term users of Aspirin, ibuprofen, and naproxen are vulnerable to peptic ulcers. Rarely, a condition known as Zollinger-Ellison syndrome can cause stomach and intestinal ulcers by increasing the body’s production of acid. Diagnostic procedures depend on the symptoms and the severity of the disease. In general, two types of tests are available: Upper Endoscopy and Upper Gastrointestinal (GI) series. This is recommended for patients suffering from anemia, weight loss, gastrointestinal bleeding, and difficulty in swallowing. Endoscope, a flexible tube with light and camera passing down through the throat and into the stomach and small intestine will reveal ulcers In the lining. This is also known as Barium Swallow. Barium will coat the gastrointestinal tract and the subsequent X-Ray of the stomach, esophagus and small intestine. Blood, stool or a breath test are performed to confirm the H. pylori infection. Among the three, the breath test is the most accurate one. For breath test, Doctor may ask the patient to drink or eat something containing radioactive carbon. Later, when the patient blows into the bag, his/her breath sample will have radioactive carbon in the form of carbon dioxide if he/she is infected with H. pylori. 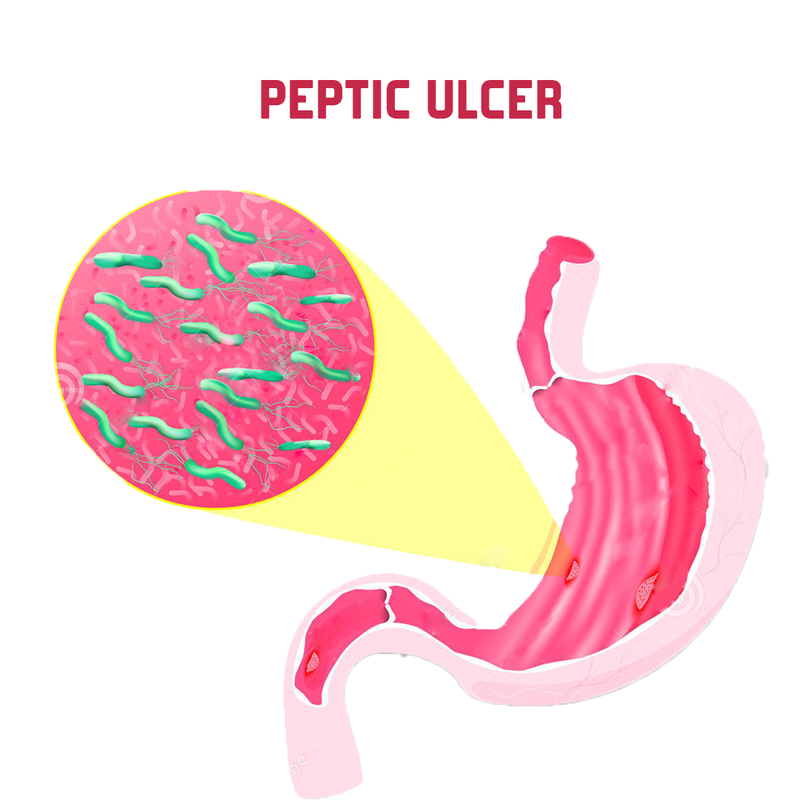 Treatment depends on the underlying cause of the peptic ulcer. Non-surgical treatment involves antibiotics, PIP’s - proton pump inhibitors, probiotics, bismuth supplement, stopping the use of NSAIDs etc. Rarely, in complicated cases surgical removal of entire ulcer, typing off a bleeding artery, cutting off nerve supply to the stomach to reduce acid production, etc are suggested.